For over one hundred forty years, Bethel Church has been ministering to the needs of the people of eastern Wilcox County, Alabama. Founded in 1856 by settlers who relocated to Oak Hill, Bethel Church continues a tradition of Associate Reformed Presbyterian influence on this area which dates to the 1820's. The Associate Reformed Presbyterian Church is the oldest Presbyterian denomination in America. Our beliefs are those found in the Holy Scriptures of the Old and New Testaments and in the Standards of the Associate Reformed Presbyterian Church. Services are held at Bethel Church on the First, Third, Fourth, and Fifth Sabbaths of each month at 9:30 a.m. Sabbath School is held immediately following the service. Sabbath School is also held at 9:30 a.m. on the Second Sabbath of each month. BETHEL'S BACKGROUND Bethel Associate Reformed Presbyterian Church around the turn of the century. In the 1820's, settlers (mainly the Bonner, Dale, Jones, and McBryde families) moved from Abbeville County, South Carolina, to Wilcox County, Alabama. These people had been members of the Cedar Springs and Long Cane Associate Reformed Presbyterian Churches. They established a congregation in eastern Wilcox County, Alabama. This church was briefly known as Pine Barren Church and Prairie Creek Church but was mostly known as Lebanon Church. Its first pastor was Dr. James Patterson Pressly. He resigned in 1840 to become professor at Erskine College. The next pastor was Rev. Joseph McCreary. Rev. McCreary was returning from the 1844 meeting of the General Synod of the Associate Reformed Presbyterian Church when the Lucy Walker, the steamboat he was on, exploded on the Ohio River. He died two days later. The last pastor of Lebanon was Dr. John Miller, who was one of the first students of Erskine College. In 1856, a yellow fever epidemic struck the Hamburg community where most members of Lebanon lived. They moved to Oak Hill to get away from the lowlands. Because of the distance from Oak Hill to Lebanon, the Lebanon Church was disbanded and Bethel Church was formed at Oak Hill. Rev. John Miller became the first pastor of Bethel. An attractive church along classical lines was constructed and dedicated in 1857. Bethel entertained Synod for the first time in 1861. After the War Between the States, Rev. Miller resigned his pastorate to become headmaster of the Wilcox Female Institute in Camden. Rev. William Moffatt Grier became pastor of Bethel. He resigned his pastorate in 1871 to become president of Erskine College. Rev. Miller returned to Bethel and served until his death in 1878. In May 1879, Rev. Hugh McMaster Henry became pastor of Bethel Church. He continued to serve the church until his death on November 2, 1933. His pastorate at Bethel of 54 years and 7 months is the longest pastorate in the history of the ARP Synod. In 1895, a larger church building was erected adjacent to the old building. The cornerstone of the old church can be seen in the parking lot of the present church. The new sanctuary was dedicated on November 9, 1895. Built in the Victorian style, it has been a landmark of Wilcox County for many years. 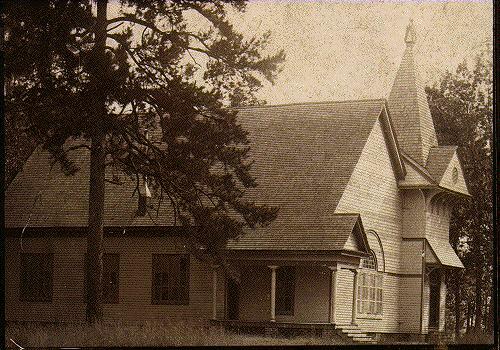 Bethel Church has hosted Synod three times (1861, 1880, and 1931), and has hosted the Synodical Union twice (1933 and 1952). Four of Synod's moderators and a president of the Synodical Union have been from Bethel. Four foreign missionaries - William Bonner, James G. Dale, Flora Harper Halliday, and Ann Woodson Prime - have all been members of Bethel Church. Bethel also has very close ties to Erskine College. Thomas Joel Bonner, a member of the Lebanon Church, was one of the first students at Erskine. Two members of the first graduating class of the Due West Woman's College (Evelyn Jones and Dannie Jones) were members of Bethel. Over the last one hundred forty years Bethel has sent seventy-three of her young people to Erskine. One characteristic of Bethel Associate Reformed Presbyterian Church which distinguishes it from most churches is its tradition of singing strictly Psalms. All congregational songs and anthems are from the metrical version of the Psalms. Until about 1950, all Associate Reformed Presbyterian Churches sang strictly Psalms. After many heated debates, Synod elected to allow the use of hymns in worship. Bethel Church was opposed to this move and continues to uphold our tradition of singing Psalms. We presently use the Bible Songs, published by the Associate Reformed Presbyterian Church in 1930. Bethel Church has long been known for its involvement in the Woman's Synodical Union. Several of her members have served as Presbyterial and Synodical officers. Though small in number, the Woman's Society continues to be involved in all facets of Church life. The Women of the Church meet monthly.